Unique Gifts for the Young and the Young at Heart! Little plush reindeer, you're a delight to behold. I want you around even when it's not cold. as you are my friend and valued family member. and the white spot on your head that's just bigger than tiny. but nothing can top our special outings in the beautiful sunshine. Sporting a red bow and jingle bells, this cute little Cushy Kids stuffed reindeer has soft brown fur, stuffed felt horns and a bright red nose. This adorable plush reindeer has hot pink and light pink fur and is festively attired in a lime green neck ribbon. 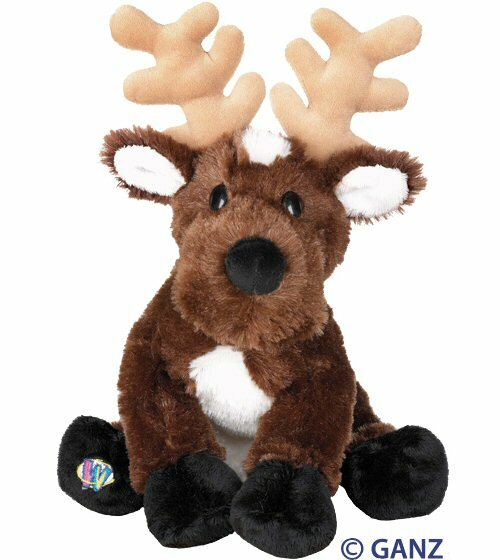 This adorable little plush elk has soft brown fur, white accents, stately tan horns, and sweet brown eyes. Cushy Kid Baby Blizzard Snowman has soft white fur, a fun black felt hat, bright orange "carrot" nose, and a smile of "coal." This adorable little Snowman Page Pal plush bookmark has a soft white body, red hat and mittens, black boots, and sweet face. Maple Moose has soft chocolate fur, dark brown pads on fun oversized feet, and velvety tan antlers. This adorable little Santa Claus Page Pal plush bookmark has a soft red body and hat, black boots, green mittens, and sweet face. This "Night Before Christmas" tale, joined with the birth of Jesus, helps explain the true meaning of Christmas while instilling the spirit of Santa. Examine our products risk free! Copyright 1998 - 2019 - CDK Enterprises, Inc. Nothing from the CDK Enterprises, Inc. site may be copied or used without written permission.